Close-up of garden tools. 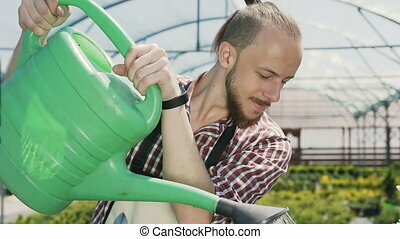 gardener going to the greenhouse, watering plants from a green funnel. garden center decorative plants and flowers. slow motion. Close-Up Of Garden Tools. 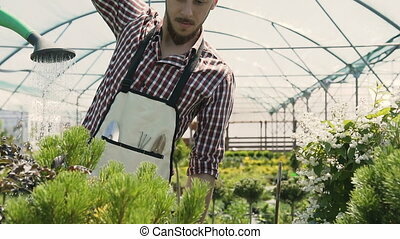 Gardener Going To The Greenhouse, Watering Plants From A Green Funnel. Close-up of garden tools. 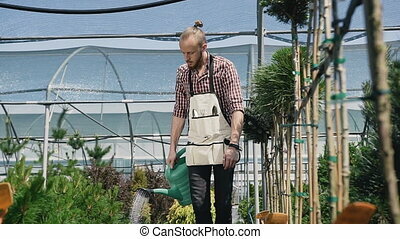 Gardener going to the greenhouse, watering plants from a green funnel. Garden center decorative plants and flowers. 120fps. Slow motion. 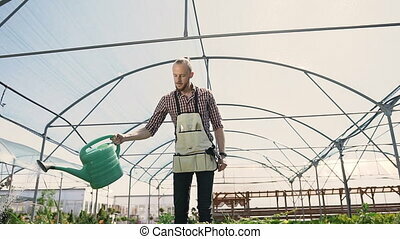 Husband gardener going to the greenhouse, watering plants from a green funnel. The garden center is green plants and bright flowers. Slow motion. Close-up. 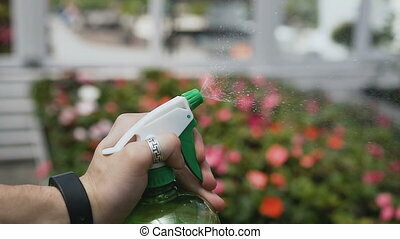 Dolly shot of Attractive woman gardener in apron watering plants and flowers with garden sprayer in greenhouse. Slow motion. Close-up. 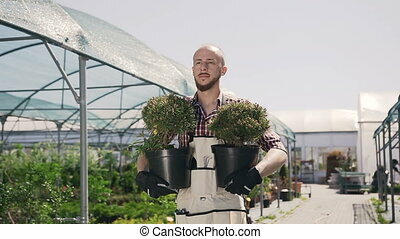 A man in an apron goes to the greenhouse and carries pots of flowers in his hands. 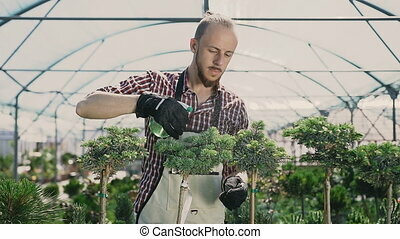 The gardener plant in the garden decorative trees. Slow motion. 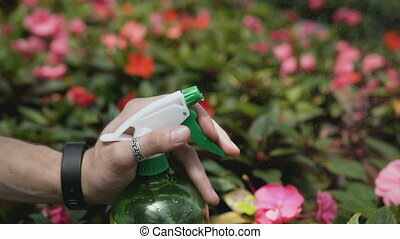 Close up of young man with sprayer watering plants in greenhouse. Care of plants, health, ecology. Beautiful hand against the background of a flowering garden. 120fps. Slow motion. 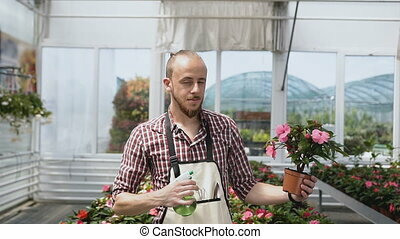 Close up of young guy with sprayer watering plants in greenhouse. Care of plants, health, ecology. 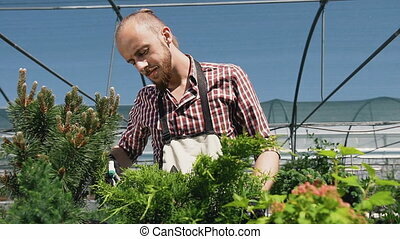 The young gardener works with plants and flowers. Slow motion. 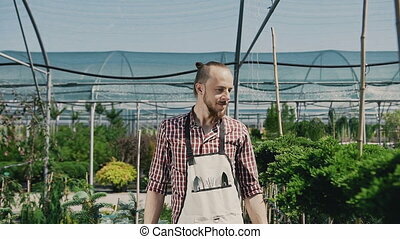 A young guy is a gardener in mittens and a garden apron, smiling and look on the camera. Large greenhouse of ornamental plants and flowers. Slow motion. 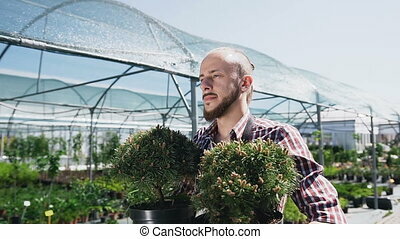 A young gardener with a beard, goes to the garden and inspects the plants. Smooth motion camera. Slow motion. 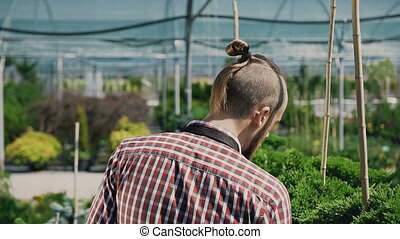 A young gardener with a beard, goes to the garden and inspects the plants. 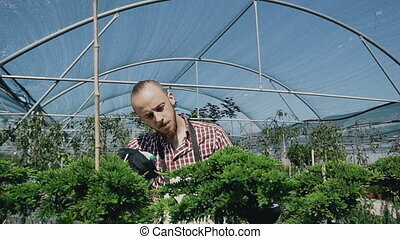 Gardeners working at the greenhouse seedlings successfully puts. Slow motion. 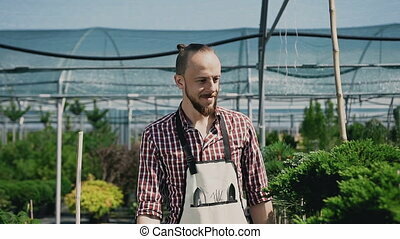 A smiling man is a gardener dressed in an apron with garden tools. Agricultural greenhouse with a lot of beautiful plants. Slow motion.